Find your favorite Santa, go ice skating, find a spot by the water for a lighted boat parade, go extreme with a Holiday Haunt, or just marvel at the lights. 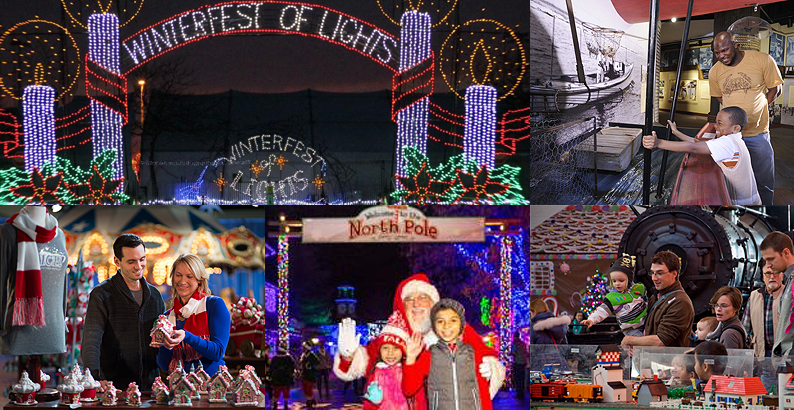 Head to our website for information on all these and other great ideas, because there’s always more during the holidays in Maryland. Honor African heritage and rich African-American culture and traditions during the seven days of Kwanzaa. Join celebrations at the Reginald F. Lewis Museum in Baltimore and the Wiley H. Bates Legacy Center in Annapolis. Whether it’s huffing and puffing around the bend on a real-life steam engine or marveling at the delicate craftsmanship of a traditional train garden, in Maryland the holidays come by rail. So whether it’s an unforgettable train trip through the mountains, or a jaunt over to the local firehouse, we’ve got the lowdown on Maryland’s great holiday train events. All aboard! Maryland is a land of makers. Experience the wonder of creativity and find hand-sewn quilts, beautiful artworks, Old World wooden crafts, and even cutting-edge 3-D printed creations at these fantastic holiday crafts shows or at the Maryland Artist Marketplace. Is it really Christmas without "The Nutcracker"? Does it really feel like the holidays if you haven’t kicked up your bell-bedecked elf shoes? For a full rundown on holiday theatrical events and where to catch the magical music of the holidays, head to our Holiday Performances Page. From the mountains to the sea, Maryland is home to vibrant downtowns and welcoming communities that make perfect holiday shopping destinations. Whether it’s a classic waterfowl decoy for dad, a funky, one-of-a-kind ornament for mom, or a delicious Smith Island cake for the whole family, Maryland's unique Main Street shopping destinations have the perfect gifts to fill every home this holiday season. It’s the holiday season, and Baltimore’s biggest attractions are in the giving spirit, so they’re giving amazing admissions deals during Baltimore Dollar Days. December 8-9, admission to 11 of Baltimore’s top attractions are just a buck, or even free! Visit the National Aquarium, the Maryland Science Center, Port Discovery Children’s Museum and many more. For a full list of participating attractions, visit our Baltimore Dollar (Or Less) Days page. Don’t miss your chance at free tickets for amazing events across the state. Every Monday on Instagram, Facebook and Twitter, the Maryland Office of Tourism is joining with our sponsors to give away great Maryland travel experiences. We call them Maryland Mondays, but you can enter all week. This week, we’re giving away a private tour and tasting for 10 at the Tenth Ward Distillery, and four pairs of speed-pass tickets to Krampus Haunted Christmas presented by Bennett’s Curse. Follow us on Instagram, Facebook, and Twitter to enter.